Reduce the amount of time spent sitting during your working day. Improve your posture & reduce lower back pain. Research has shown that alternating between sitting and standing will strengthen key muscle groups resulting in a higher basic metabolism & reduce rest intervals of specific body parts helping to prevent injury. Decision making when standing is on average 5-20% shorter than sitting. The perfect solution? A desk that can be raised or lowered allowing you to stand for a while and then sit for a while. 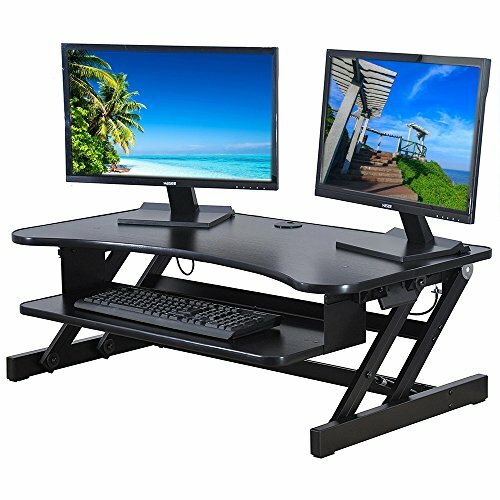 LARGE WORK AREA: The top surface measures 37"(L) x 21.6"(W) x16.3"(H) providing plenty of space for single monitor, dual monitor, or laptop + dual monitor setups. The secondary surface has enough space to fit a keyboard and a mouse. ERGONOMIC KEYBOARD TRAY: Staggered height between keyboard and monitor keeps monitor at proper height to prevent neck strain without manual adjustments sitting or standing, keyboard tray extends for optimum comfort, keyboard dimensions 29"x 11.8"inches. ADJUSTABLE HEIGHT: The height adjustment from 7" to 16.3" above your desk surface with 5 incremental height options, rear height adjustment levers, recommended for people 5'3" or taller. STURDY CONSTRUCTION: Sturdy Heavy Duty Frame with Gas Spring Mechanism Supports Up to 50 lb. Keep stable and solid even fully extented. EASY and QUICK TRANSITION: No assembley required.Go from sitting to standing in one easy smooth motion. Spring lift mechanism assists with the lifting motion, even with your computer and monitor on it. If you have any questions about this product by WINMI, contact us by completing and submitting the form below. If you are looking for a specif part number, please include it with your message.